The Simpsons Homer Message Mate has to be one of the most annoying gadgets I have ever seen. Basically you sit Homer and his sofa on top of your TV and every time you press a button (I said every time) on your remote control he blurts out one of a number of recorded wise-cracks. This was fun for around 2 minutes and then I started to get a little ticked off with it. 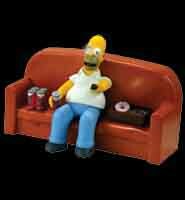 Sure Homer is funny but when he interupts your TV viewing everytime you alter the volume or change the channel it can be very frustrating. You an also record a message for anyone else in your house to pick up (basically a replacement for a written note which you could stick to the TV). Simpsons fans will lap this up - and to be fair it's quiet novel for a short time. It's just so damned annoying!